The MEMPHIZ TV3 is one of our top products. This high-quality indoor LED screen is modular in construction and can be installed mounted or suspended depending on the requirements. Our client used this screen as a banner above their trade fair booth at Dmexco in Cologne. The screen fits perfectly into the design of the trade fair booth. The Dmexco annually attracts exhibitors from the field of digital marketing and digital economy. With approximately 340,000 visitors, Gamescom is regarded as the world’s largest trade fair for interactive consumer electronics, in particular for video and computer games. We installed a 120m2 MEMPHIZ 10 for our client. This screen can be rapidly set up and is therefore outstandingly suited for large areas. It is homogenous, colourfast and suitable for daylight applications. The GQ Award is regarded as the gentleman’s event of the year: Outstanding personalities from show business and music, politics or sport are honoured for their performances. Special men require a special backdrop. The MEMPHIZ 6, MEMPHIZ TV 3 and our VEGAZ LED curtain were used for an unparalleled stage set. The screens formed a mobile installation appropriate for the stage set. Professionals demand quality - justifiably! High-resolution LED screens are increasingly in demand for high-level manager congresses or annual general meetings. In these cases, we additionally use our Watchout media control system. As a result, different image contents such as live camera, Power Point presentations or image films can easily be recorded as required. Our client rented 90 m2 of the DALLAZ 4 HD high-resolution LED screen for a product presentation. The screen was installed suspended on a truss. The DALLAZ 4 HD is an innovative product which is equally suitable for applications in indoor and outdoor areas. Being on the market for a quarter of a century is definitely worth a party for a company, and as a thank you to all employees, our client organised a large-scale party with a “green” carpet for their employees. We supplied our LED video floor. The LED floor is individually playable, and with an installation height of 11cm and a rail system, it can be quickly laid and also functions in outdoor areas. This product can bear loads of up to approximately 500 kg per square metre, meaning that it is also suitable for automotive presentations. 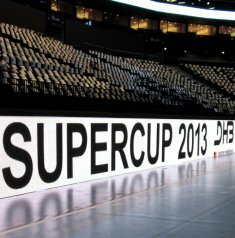 Our MEMPHIZ LED perimeter system is used as a modular installation at the respective match venue of the German national handball team. It is excellently suited for television broadcasting. Our perimeter system also “plays” with national league teams such as SCM, MT Melsungen or SC DHfK Leipzig. Again and again, clients seek cool, innovative technology in order to stage their products: Here we installed our VEGAZ LED flooring. The floor has an installation height of 11cm and is laid on a sturdy rail system. This floor is also perfectly suitable for outdoor areas. The feed occurs in a classic manner as with an LED screen. Product presentations are part of daily business for large brands. 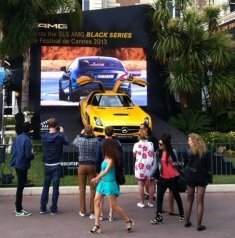 In this instance, our DALLAZ 6 HD outdoor screen accompanied a Mercedes on its advertising journey to the film festival in Cannes. This screen is easy to set up, and is homogenous and suitable for daylight applications. Our flexible TEXAZ FLEX 10 LED screen was perfectly staged here: It was installed as a cylinder on a substructure. 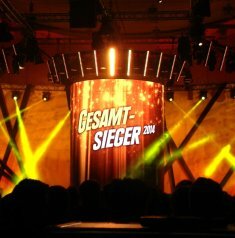 The substructure was moved to the left and right so that the winners of the award entered the stage through the screen. LED screens can enhance every stage set, and if employed properly they underline the impression of a professional and high-quality show. In this case, the presentation is a composition of a live demonstration of own products and created image films which are fed via the six LED areas. Here our client displayed a classic variation with smart use of an LED screen at the Uniti Expo in Stuttgart. Clear design and plenty of space attract visitors to the trade fair booth. Short image films with succinct statements run on the LED screen. Simply great! Our clients put innovative products on the market – and so do we! Here the 44m2 MEMPHIZ TV 3 is installed on a layer substructure. The lower edge of the screen is 2.50m. Our client presented live camera images and presentations to their guests via the screen. 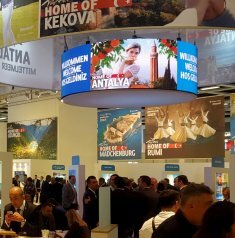 For many years, we have been able to support our clients at the international tourism trade fair in Berlin with diverse LED video technology in many different sizes. Here you can see our high-resolution MEMPHIZ TV3 indoor LED screen. It is frequently requested and used by trade fair construction companies. This screen provides you with many benefits, such as light module weight, high resolution, sophisticated mechanics for rapid set-up and dismantling. In summary, this is the perfect product, even for small sizes. At the ITB, we installed five identically-sized TEXAZ FLEX 5 LED video cylinders. These LED video cylinders were played with different contents. The TEXAZ FLEX 5 is a flexible screen with a resolution of 5 millimetres. The setup of these modules as cylinder, wave or area versions is quickly and easily possible thanks to the clever mechanisms. An LED screen is an excellent solution as a backdrop on stage for image films or live camera recordings during a show. The MEMPHIZ 10 indoor screen was mounted on stage. A stacker system secured the LED wall to the rear. Thanks to the high resolution of the MEMPHIZ TV 3, this LED wall is perfect even for small formats. We installed 7m2 of the TV 3 on to a stage platform for our client. The screen is secured to the rear using a stacker system. Whether concerts, tours or festivals, we assist with the suitable outdoor LED screens for every show. For Paul Kalkbrenner, we installed our reliable DALLAZ 10. This product is versatile and extremely popular with our clients. An excellent choice, especially for large areas. We make many things possible for our clients. For example, we also deploy our LED screens in far-off Dubai or Bahrain. The master of the piano, Elton John, used our VEGAZ LED curtain for a show in Germany. The modules are comparatively light and are therefore excellently suited for suspended installations on stage. Various artists play at the IFA on beautiful summer evenings. We installed our large-screen DALLAZ 10 for these shows. Our DALLAZ LED perimeter system shapes up well at various indoor and outdoor tennis tournaments. It is reliable and is particularly well-suited for TV broadcasts. For many years, we have supported various clients from the field of winter sports. Our team has experience in installing screens under adverse conditions due to cold, snow and ice, for example, during the biathlon in Oberhof. We have innovative, modern LED screens in our portfolio – take a look yourself and visit us at Best of Events in Dortmund or at Euroshop in Düsseldorf. We look forward to meeting you! In the meantime, many trade fair construction companies plan organic shapes into the trade fair booths of their end customers. There are many variations and realisation possibilities available. 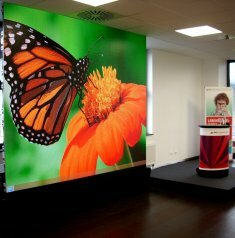 In this example, we installed 30m² of the TEXAZ FLEX 10 in a wave shape. In the meantime, LED screens are a “must-have” for many exhibitors. Image films, live content or graphics are shown on the screens to attract visitors. 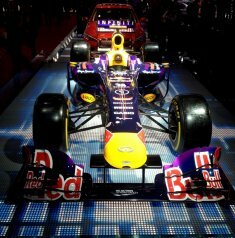 LED screens can be excellently employed to achieve a long-distance effect at trade fairs. In this example, we installed the TEXAZ FLEX 10 flexible LED screen as a banner for our client. We installed different LED screens as over-dimensional cubes for our client. In total, more than 200m² of LED screen area were installed. Our client positioned little highlights distributed throughout their trade fair booth using LED video flooring. The stripes guided visitors through the trade fair booth to the rear conference area.